I have been to a few places in China and this trip is specially to visit the Hakka Tulous. Being a Hakka myself, naturally I was curious and had always wanted to see the tulous(土楼) which had been featured in many documentaries and in 2008 declared a UNESCO World Heritage site. 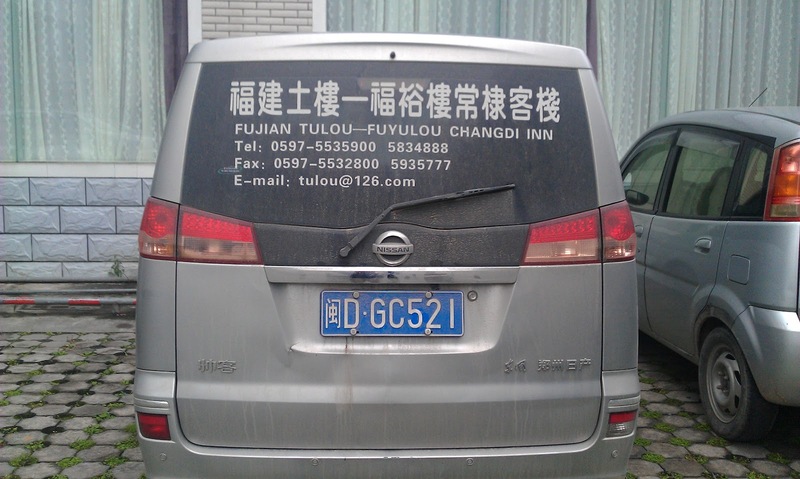 When I mentioned to some friends that I would be going to China to see the tulous there are some who have completely no idea what tulous are. For those who have not heard of tulous, they are actually buildings which the Hakka people lived in. Most of these dwellings are near the south western part of Fujian Province. Besides seeing the tulous, I also wanted to visit Dabu County because I am a Dabu Hakka. I had wanted to take a budget flight to Guangzhou and from there find my way to Dabu and the tulous. After much research, I found it not feasible to start from Guangzhou as it is not really near the tulous, so I decided to start my tour from Xiamen. As usual, I went round the travel agents scouting for Xiamen tours which included the tulous and Dabu. Most Xiamen tours do not go as far as Dabu even though it is not that far from the Yongding tulous I had already been to Xiamen before and most of the tours would include a few days of visiting Xiamen. So there is no point for me to join a guided tour. Coincidentally the Penang Dabu Association (which I am a member of) also organised a tour to the tulous and Dabu. The itinerary also included a few days of Xiamen. The fare suggested was nearly 4k and on certain days it would be free and easy in Dabu for you to visit relatives. Again it was not practical for me to go along, so I worked out my own tour. Since my wife's ancestors were from Longyan which is not far from the tulou areas, I planned out an itinerary which would include Dabu, Longyan and most importantly the tulous. After checking out various travel websites, I decided to spend the first two days in Longyan to visit the Longkong Caves, the Peitian Ancient Hakka Village, the scenic Yunlong Bridge and the Guanzhai Mountains. After that we would head south west to Yongding where most of the tulous are located and continue to Dabu which is nearby. We planned to end the visit in Xiamen and do our shopping there. In this post, I shall highlight the tulou visit and in later posts I'll share my experiences in the other legs of the tour. Through the internet I contacted someone to arrange for my transport for the tour. It wouldn't be feasible to go by public transport as the places I wanted to visit are not accessible by public transport. I managed to arrange for a hired car plus driver to take us for the 5 days. The normal rate for hiring a car plus driver is only CNY400 (RM200) a day but the total sum might come up to a higher amount depending on your tour. If you hire the car for a few days, they will have to add certain charges because the driver will need to find accommodation as well, if you cover a large area. And since the driver is based in the mainland, we had to pay extra for him to come and fetch us in Xiamen. For my case, the total sum for 5 days came to CNY2800 including extras like paying for the toll if you choose to save time and use the highway instead. Paying RM1400 for the two of us for 5 days is actually RM140 per person per day, quite worth it. If we were a larger group, the cost would be even lower per person. After all, it was a seven-seater MPV which could have accommodated 4 more people at no extra cost. On the first day, we arrived in Xiamen and took the shuttle (CNY10) to the railway station and walked to the nearby Longdu Hotel. Early the next morning, our driver came to take us to Longyan. After two days in Longyan we decided to go straight to the tulous instead of spending a night in Longyan. We actually stayed the night in a tulou in Hongkeng Village. Hongkeng Village (洪坑村) is the most concentrated of all earthen house clusters. There are about 100 tulous of various sizes in the long village lying along both banks of a river. Some of the house designs are unique, including the Zhenchenglou (振成樓), Fuyulou (福裕樓) ("Five-Phoenix House"), Kuijulou, and Rushenglou. All the buildings are still lived in—they aren't just historical relics.The one we stayed in is the Fuyulou. When we arrived it was already dark, and we had dinner at the tulou we were staying. The building was of course ancient-looking but the room had been converted to a hotel room. The furniture is basic with modern amenities, including electric blanket. There is a shared bathroom on each floor but it wasn't a problem sharing because there weren't many guests. We were the only guests staying on our floor. As long as it is clean and comfortable, we didn't mind. After all the room only costs CNY100 (RM50) including breakfast for two. Entrance to the village is CNY90 per person and hotel guests also have to pay. The largest tulou in the village is Zhenchenglou, nicknamed "the prince of tulou", which is a double ring tulou. Its outer ring is 4 storey high, with a total of184 rooms and the inner ring is 2 storey-high with 32 rooms. The outer ring was partitioned into four segments according to Bagua concept of Chinese Fengshui. To give privacy to the villagers, tourists can walk in to any tulou but are advised not to go upstairs, unless invited. This is the loop-hole where the residents will tell you that if you pay them CNY5, they will invite you upstairs as their guest. Of course we paid. For RM2.50 each, we get to go to the top floor and have a better view and take photos. And for CNY10, we had our photo taken by a photographer who stood on a stool to get a better angle. He even gave us some tips on how to get better shots using my DSLR. After spending half a day walking around the village, we had our lunch and then checked out. 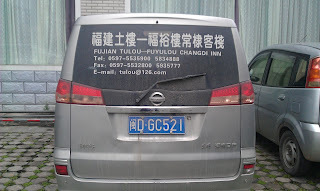 The driver then took us to the Gaobei tulou cluster. Here we visited Chengqilou the largest of the earth buildings. It is almost three hundred years old and is made up of four concentric circular buildings. This King of Round Earth Building has altogether 400 rooms and used to house 80 families, totaling more than 600 people in its prosperous days. There is a lookout point where you can take panoramic views of the tulou cluster, but it is quite a climb!. Unlike the other large tulou, here visitors are not allowed to go up the building, I guess for safety reasons. We had planned to visit Chuxi Tulou after the Gaobei cluster but when we arrived, the entarnce to the village was blocked by a group of villagers. They were having some sort of dispute and protest against the authorities and we were not allowed to enter. We had to cancel this visit and proceeded to Xiayang to relax in the Capital of Hakka Hotspring Resort. More on this in the next post.